Black ice is mesmerizing. Near shore you can see leaves and moorings and lake-bottom scrum through the clear ice, cut with wavy cracks and tiny plunging bubbles of white. Where the water gets too deep for the bottom to show the ice is black, glass against the darkness of water. The lakes and ponds around me usually freeze gray — all those tiny white bubbles so close together they make a gray smudge, clouding the ice. 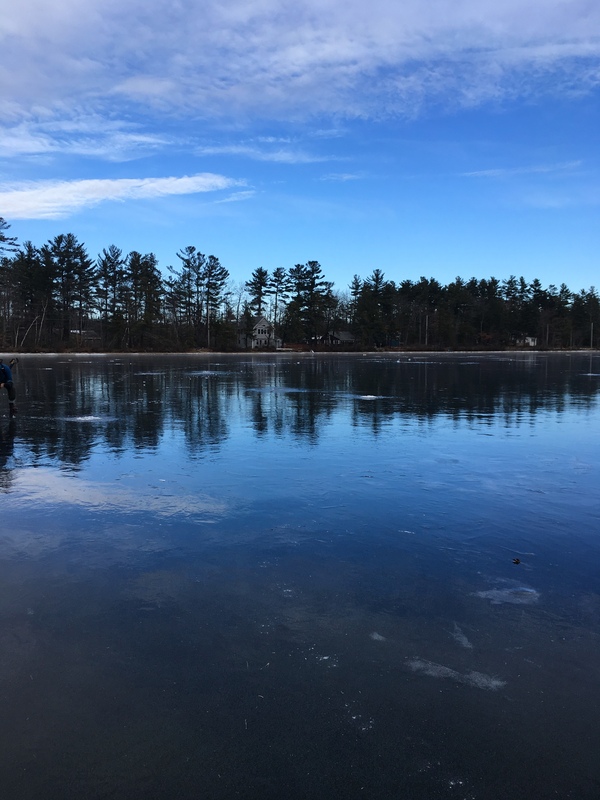 This year the ice-making weather the last two weeks has been perfect for freezing water clear and I heard from two friends that Pleasant Lake froze black. Yesterday David and I went to see it. The last time I remember seeing such a big body of water covered with black ice was more than 10 years ago. Walking across the lake on microspikes was like walking through a brilliant black and white abstract art show. 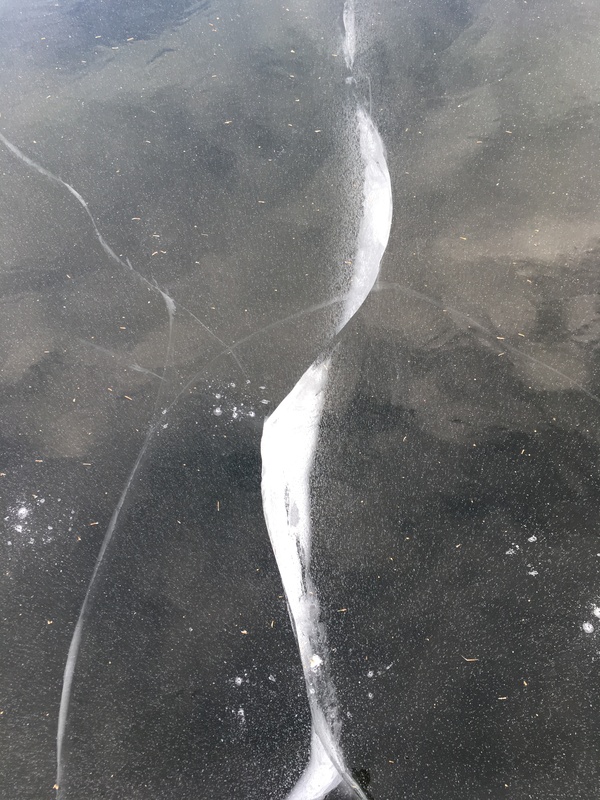 Thin dark lines on the surface slit down into white and crystal waves and twists, a crack that criss-crossed countless other cracks and curled off across the lake. Patches of fine snow turned out to be collections of minuscule bubbles trapped in ice, nothing to brush off, the surface smooth under my mitten. Shards of ice cut by ice fishermen gleamed like gems in the muted sun. As we walked the ice sang like a whale, gulps of settling and laser-ping pulses echoed out across the flatness. We walked towards the eastern shore and the blue of the sky lit the lake, the line of reflected trees receding as we moved closer, a doubled edge boundary we never reached. It’s been two weeks of firsts, though the wedding last weekend that David and I officiated was the third for each of us. But it was the first time we’ve done it together, and many of the guests commented on how nice it was to have a married couple perform the ceremony of marriage for another couple. The most impressive first of the wedding was hiking with the bride. The original plan for the wedding was to do it on Neville Peak in Epsom, the proposal location and also a frequent hike for the bride when she visits her aunt and my friend Alison. But getting all the guests to the summit wasn’t going to work, so instead a hike after the wedding was planned. The hiking option was announced on the invitation: ceremony at 2:00, hiking or cocktail option at 3:00, reception at 5:00. Would anyone really choose hiking over cocktails? The ceremony wasn’t very long, so there was time for both. 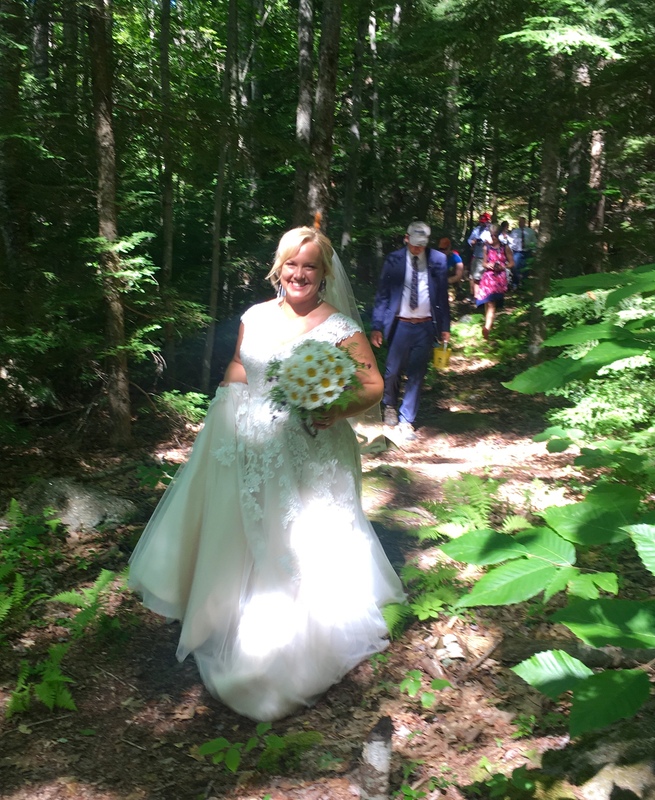 After photos and drinks, the bride bustled up the train of her embroidered and beaded gown and walked down the driveway and started up the dirt road to the Epsom Town Forest, headed for the beaver pond a mile uphill in the col between Nottingham and Fort Mountains. At least half the wedding guests followed, still in dresses and suits and shirts and ties. It was a merry sight. A one point a young family passed us on their way down the trail and were surprised to see a beautiful bride in her white gown, sparkling and magical. The two little girls stared and the parents stood behind them looking puzzled. “It’s like a fairy tale,” the father of the bride said and the girls kept staring. “It is a fairy tale,” I said, then pointed to the bride. “And she’s a magical goddess.” The bride smiled, the groom smiled, we all resumed hiking. The next day David and I went to pick up Emilio, who spent last week with us on a camp on Northwood Lake. Friday afternoon, as we were getting ready to drive Emilio home, he and David made a list of all his “firsts” of the week and wrote them in the cottage guest book. So many firsts, so much fun. It’s been a great couple of weeks. There should be a name for the color of the particular blue deepening into purple-black indigo of winter evenings, especially as a day of snow slips over into sleet. The indigo glow through my windows right now brings back this poem from February 2007. The barn and shed and silo are still there, though the farmhouse burned. And l need a bigger wagon, there’s so much more to hold than a hole now. weathered to the gray of a cut snow bank. the pure snow before the storm slipped over to sleet. the world is flat even as I know it is round. the sun creaks, stops, reverses. A week ago David and I finished the holiday gift I gave him for 2017 — a commitment to visit at least one museum and have one outdoor adventure a month. Experience gifts make sense — we already have so much stuff — and they’ve been a needed break from the dread and disgust that’s been too present for the past year if you’re paying any attention at all to what’s happening in the world. Which we are. Early on we decided if we went someplace outdoors we’d never been before, that could count as an outdoor adventure. It didn’t have to be arduous. Just new. We also realized early on that there are a lot of museums near us. New Hampshire has a snowmobile museum, several rail depot museums, a telephone museum, a model railroad and toy museum, and a classic arcade museum that has pinball machines and electric games built no later than 1987. We didn’t go to any of those, but we did go to the NH Historical Society museum which has an old ski-doo snowmobile as an exhibit. So what did our year of art and adventure include? We trudged through snow up a hill in an orchard under a full moon. We camped in Evans Notch and hiked the Baldface Circle (very arduous! 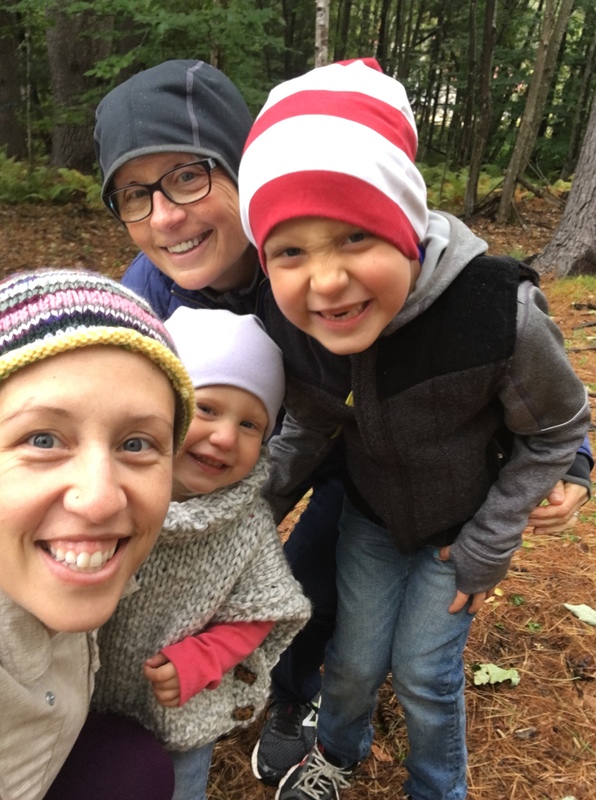 ), slept on the front porch three times in the last month, toasty in big down bags, swam in the North Atlantic twice in September and in Long Pond during the second week of October. Wet suits are magic in cold water, but we came out a bit off balance from the cold affecting our inner ears. 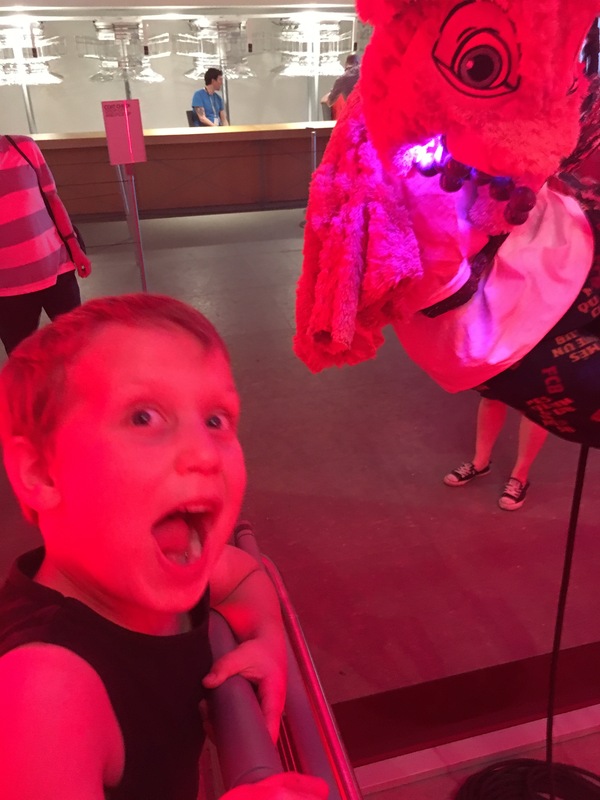 Our museum visits ranged from interesting to mind blowing. The Deep Cuts exhibit at the Currier, featuring impossibly intricate and detailed paper art, was a marvel. We took in the Whitney Biennial along with Adrienne, Emilio and Ava. We went to the Museum of Fine Arts in Boston twice, most recently to see a phenomenal performance of poetry read by Jane Hirshfield (her own and her translations of Japanese poetry) and music composed by Linda Chase. The three part piece was a collaboration written in response to the earthquake and tsunami in Japan, and was masterfully done. Stunning music along with spoken words in the best weave of the two I’ve ever heard. And that was after being enchanted by the exhibit of wild and vibrant wall-size murals by Takashi Murakami. My favorite museum visit was to the Northwood Historical Society’s museum, open on August Saturdays from 1:00 to 3:00. The town’s artifacts are housed in the small, square, brick building that was the Northwood Narrows branch of the library when I first moved to town. It’s around the corner from my house. David wore his short wetsuit for that visit; we stopped at the museum when we saw it was open on our way to swim. The Historical Society volunteer staffing the museum that day didn’t pay any attention to the wet suit. She was too busy watching the two helicopters circling over the fields and woods of the Narrows, looking for a fugitive batterer, a man who’d come to town after abusing his girlfriend and then ran away from the police when they found him at a house on Blake’s Hill. They caught him. It was an exciting day in the Narrows. 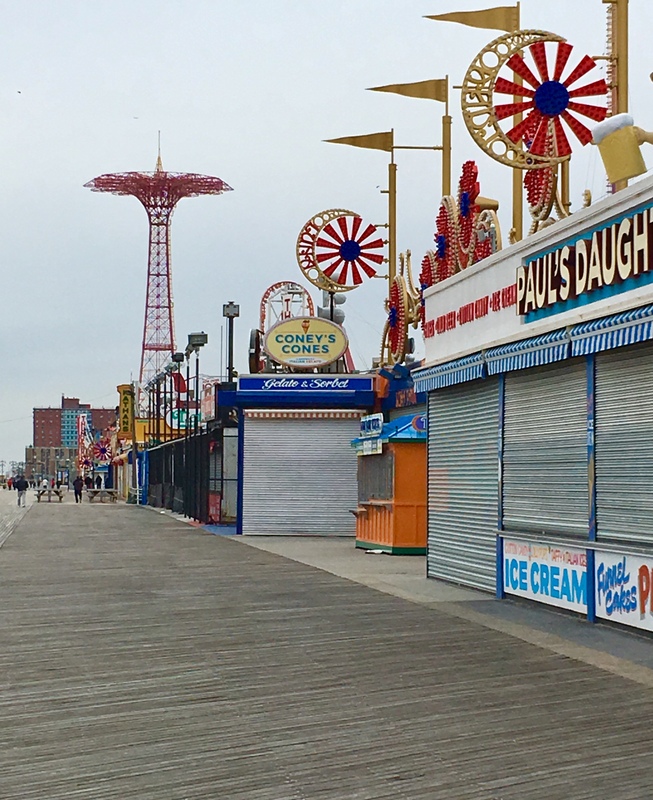 Last Friday we walked the boardwalk on Coney Island, a good choice for our last outdoor adventure of the year. Closed for the season, the arcades and amusement parks were like huge broken toys. We walked with a cold wind at our backs, then turned and walked into it, along the gray water, the winter sun low in the sky. We walked for a long time. I’m grateful to have a life that allows me to choose experiences like this, to take breaks that refresh and energize and inspire me. I hope to keep it up next year. Full wetsuit, bathing cap, goggles. Warm clothes to put on as soon as we get out of the water. A tentative wade off the small beach to make sure the water temperature hasn’t unexpectedly dipped into an intolerable range. It hasn’t. Plunge. My face stings and the tips of my ears that aren’t covered by the swimcap ache. I keep swimming. Thirty strokes into the swim my two toes that don’t tolerate any kind of cold are numb but my face is fine. I look up and see David’s blue-capped head swimming up behind me. Back to counting my strokes, twenty breaths to the left, twenty to the right. When I lift my face for air the hardwood trees along the shore are red, orange, yellow and gold against the dark green of pine. Face back down to pull my stroke the water streams a cloudy bronze as my fist punches bubbles under the surface. Face up again to the string of color on the shore. I catch a glimpse of blue sky as the fast clouds above break apart. Across the pond and back, heading into a hard wind left from the front that blew through with rain this morning. It whisks the surface of the pond blue-black with white wave caps. I stroke harder. When we get out the air is warmer than the water and there’s no wind under the pines on the beach. We’re not as cold as we expected, but there’s still a chill somewhere deep. We’re a bit off balance from a half hour of cold in our ears and tilt as we get dressed. We go home and take hot showers. For a long time. “How’s it going,” Jon Lovett asks. So says Marc Maron in this week’s podcast of Lovett or Leave It. Maron goes on to counsel that you do have to figure it out. 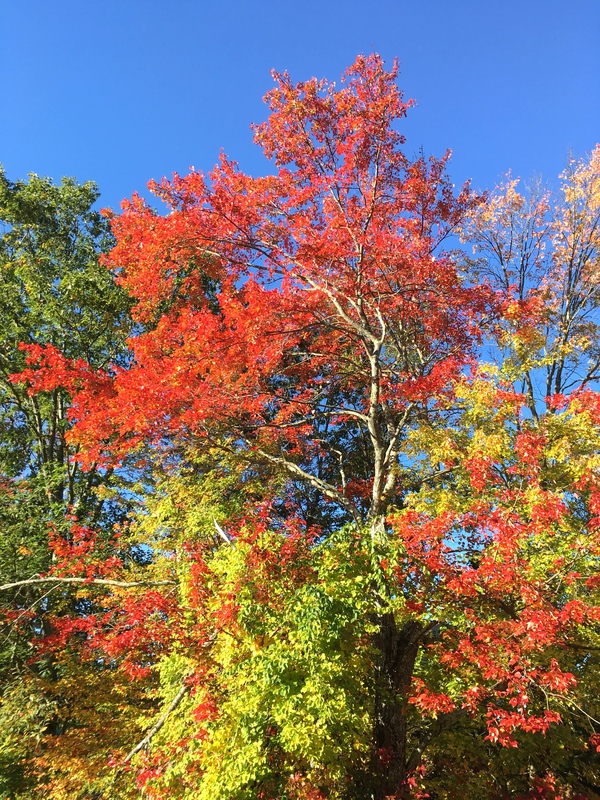 Trump thrives on making us mad and scared so when you let the unprecedented unprecedentedness of the terror of his presidency keep you from enjoying the clear blue of a cool autumn day in New Hampshire after spending two days playing with the unspoiled and precocious children of your child, then he’s won. Resistance is enjoyment of simple pleasures and there’s nothing better than a rainy Saturday morning entertaining beautiful children so their parents can have a rare morning of sleeping in together. I have to say this over and over in order to write blog posts. What difference do my experiences make, as sweet as many of them are? Well, they make a lot of difference to me and then I have energy to at least try to do my fifteen acts of resistance a week (way off that average recently having taken over a month more or less off). And my frequent emails to Mitch McConnell (go here and join in the fun) telling him I’m afraid in a way I have never been as an American (fear is a core motivating message of Republicans so I love being able to honestly use it to oppose McConnell’s unconscionable behavior) are actually renewing. Life has been good to me recently and horrifically hard for a number of people I love. So all that makes sense is to share the extra generosity of my life. Mortality and change and rain then sun, zinnias and eggplant running into colder weather but no frost yet, bouquets in the house still and all the colored paper clips put away from Ava “working” at my desk this morning. Ava loves to help put things away and clean up. Emilio has an arm that’s astounding for a six-year-old. Really. We measured our football throws this morning and as I thought he can throw twice as far as me. I’m ready for the next week. I’ve been an infrequent blogger this summer, mostly because for the second summer in a row I’ve largely let go of any writing habit. 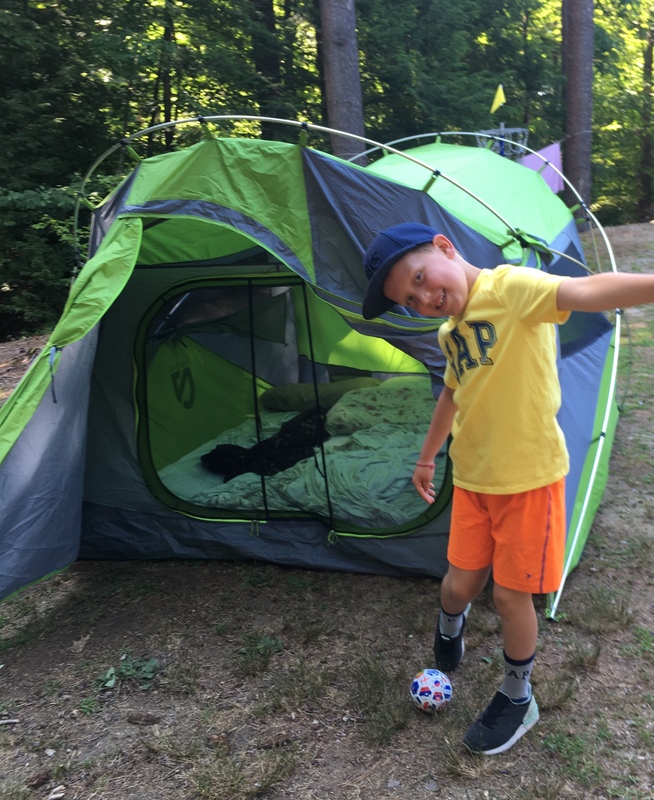 It started with the week in June with Emilio, playing like a six-year-old since I was with a six-year-old, which was enormous fun but left no room for writing. An editing job with a July 1 deadline also ate up most of my desk time, making other people’s writing work better, leaving little energy for pulling my memoir into a better shape. 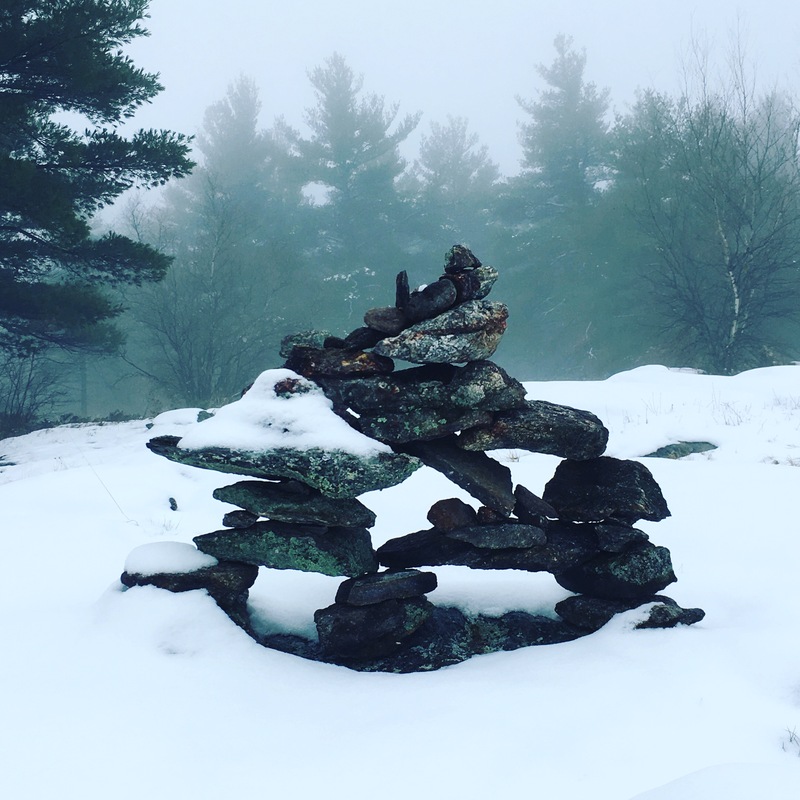 Then it was vacation time with family, followed by a week at the Vermont College of Fine Arts Postgraduate Writers’ Conference, a week spent immersed in workshopping, generative writing, outstanding readings by the outstanding faculty and talks about the craft of writing. It was inspirational and gave me a clear bead on exactly what I need to do next to get my memoir in shape to get it out into the world. But there’s was no time to actually work on the memoir. The week at home after the conference and before returning to New York for another week with Emilio was consumed with harvesting and processing the bounty from my garden (yes, an electric mesh fence really does work — at least so far — to keep the woodchucks from eating my vegetables and flowers before I can get to them). The time I did have for creative focus I found myself drawing, pulled into my right brain after a week of such intense language, left brain focus. Today I fly back to New Hampshire and will have 24 hours at home before David and I leave for over two weeks in Ireland. It’s been a very fun week again with Emilio — playing miniature golf, seeing how many times in a row we can catch each other’s throws (55 is our record), going to parks and playing the game of Life. He and I can be silly, serious, focused, scattered, wild and quiet together. He’s sweet and intense, loving and competitive and fiercely athletic. I’ll miss being with him and Ava every day; the energy of small children is amazingly centering because there’s no time to be anywhere other in the moment you’re in with them. An added bonus of the week: celebrating my birthday which included Ava painting her legs with the blue frosting on my ice cream cake. It was impressively messy and abandoned. Emilio continued his habit of taking whacky selfies while I’m driving. Now I’m looking forward to a traveling adventure with David. It’s been a long time since we’ve spent a couple of weeks only with each other, exploring a new country. 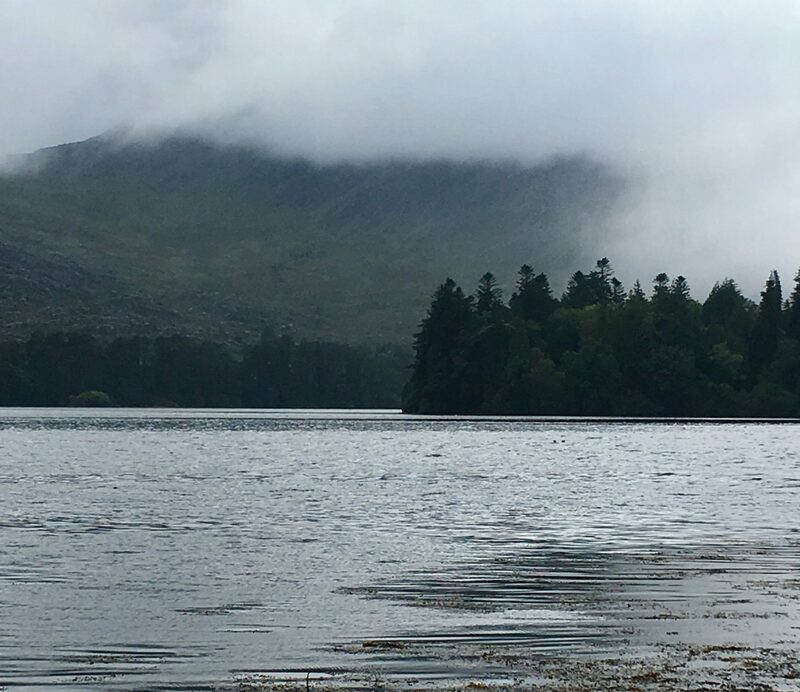 We’ll be walking the Beara Way, then traveling to Connemara and Donegal. From everything we’ve read and heard about Ireland, I expect we’ll be stunned by beauty, heartened by a friendly culture, and cheered by the camaraderie of pubs. I’m also going on a Twitter fast. Who knows, maybe I’ll even go a day or two without checking the news. All of this activity has made the summer fly. But it’s not over yet and this next journey should be as rich as all the summer I’ve already lived. Want to get a sense of what it’s like to walk, drive, drink, tour, discover and relax in Ireland? I’ll be blogging while we travel, so follow along. 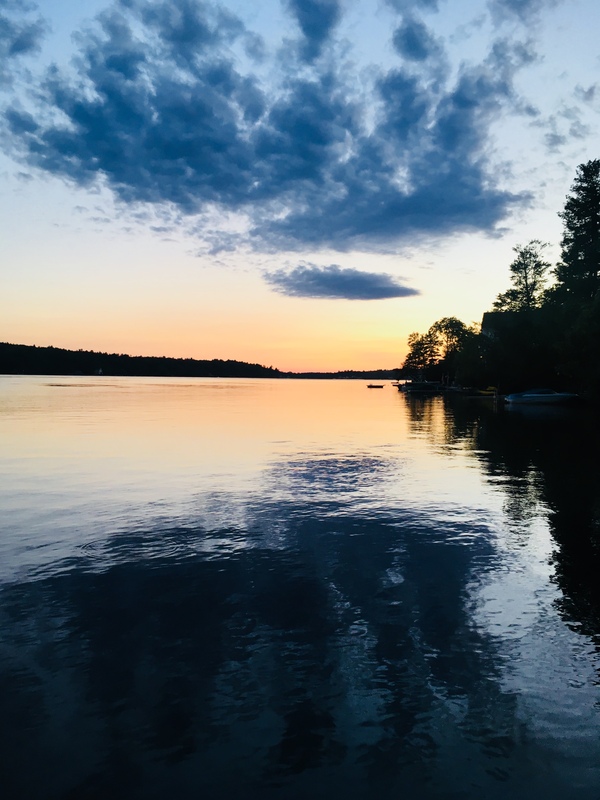 Though David and I have been renting a camp on Jenness Pond, a few miles from our house, for over a week now, we’ve only just started staying here at night. There’s been a wonderful assortment of people filling the camp — family, friends, and friends of family, including our children and grandchildren and our children’s friends and their children, lots of little ones from age eight to two. There’s nothing like the noise of children playing in water. There’s nothing like playing in the water with children, no matter what age. With fewer visitors coming through the camp this week, last night we blew up the air mattress to sleep on the screen porch for the first time, something I’ve been thinking about since we did it last summer. Falling asleep in the night air is such a treat, and not having to set up, then crawl in and out of, a tent to get that sky-just-past-the-mesh feeling, is a highlight of this camp. Except last night was the coldest yet this summer. Rain all day, wind, and temperatures in the low 50’s, by dinner time we lit a fire, the first time in this house, probably the first time in July. After an evening warming up by the fireplace in the living room, we went out to the porch to go to bed. Layered between two comforters beneath and three above, David in a wool hat and down jacket and me in a hooded sweatshirt, we fell asleep with a cold summer night all over us. What a treat. This morning David and I sat on the porch couch, a comforter over our laps as we read. A pair of kingfishers spent the morning chitting from the trees along the shore, flying to the post at the end of the dock and the railings of the raft ladder, scanning the water for a meal. At one point a guttural squawk made us both look up. A heron was flying directly towards the porch, then turned and moved along the grasses on the shore. Late this afternoon the noisiest event on the pond was the flapping and prancing of ducks, lifting themselves out of the water by the dock with a furious slapping of their wings. The sun and clouds traded places and the pond was silver and then black. There was enough sun to warm the air, enough that I probably won’t have to pull up the hood of my sweatshirt when I go to bed. 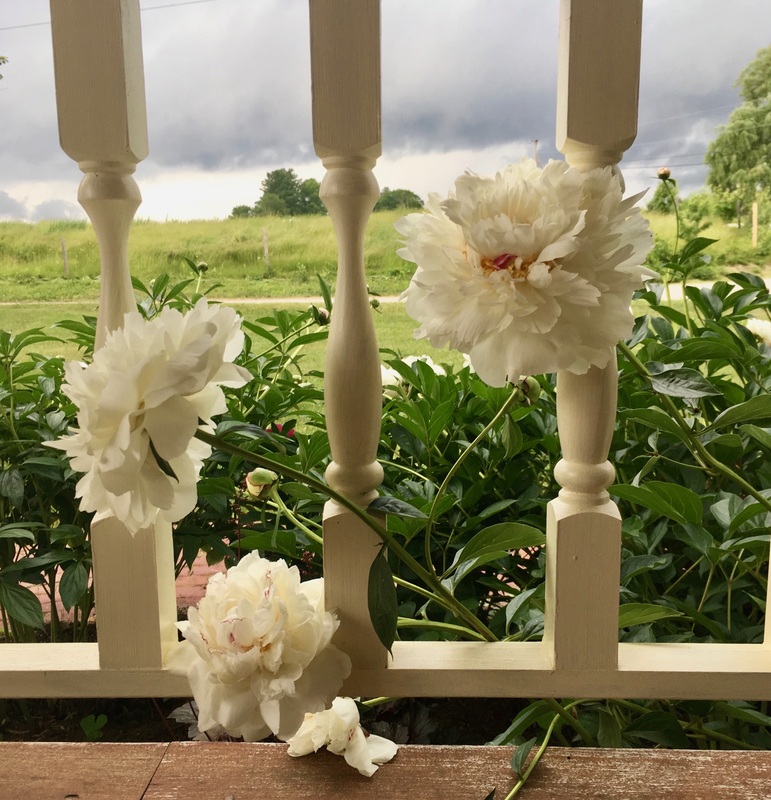 Home, on my porch, as gray storm clouds pitch across the sky and peonies poke through the balusters. For a change I’m not going to miss peony season in my yard. The last couple of years I’ve been away during the peak of peony blossoming. To extend the season, I wrapped buds in newspaper and stored them in the refrigerator. When I took them out weeks later, once I was home for awhile, they bloomed. This year I’ll get to pick the heavy heads as they open their extravagant faces, petals tucked in petals tucked in petals in silky folds that seem like forever. The house smells like heaven. I have such peony bounty yesterday I brought a bunch to a family gathering in Massachusetts. This morning I sat on the porch of the beach house my siblings are renting, watching sun begin to brighten the ocean out near the horizon, the never ending in and out of the waves, white water on white sand. Beautiful. But I’m happy to be home. Instead of the hot, dry, empty, full ocean beach view, now I face a green world of rampant vegetation and peonies so thick they become part of the porch. I live in a beautiful place and it’s a treat to be here in the height of the light season. I’ve been away a lot. Last week I was in New York playing with Emilio. We had a blast — a ferry ride to Fire Island, wave tag on the beach, ice cream every day, a DIY water park in the backyard with Ava, timing how long it took to round the bases of a ball field and run the smallest circle on the running track at the park. Short distance, Emilio is faster than me. Youth is a powerful thing. Now I’m sitting still on my porch as the rain approaches and wind begins whipping the tall grasses in the field across the street. Most of the coming week ahead I’ll be home. Next week too. And the next and next and next until I’ve been home the seven weeks I don’t have to be anywhere else for longer than an overnight. I’m delighted. I’ll bring in a fresh bouquet of peonies every day. Then it will be zinnias and cosmos, marigolds and nasturtiums, salvia, rudbeckia and poppies. Plus lettuce, kale, peas, beets, squash, cilantro, basil, peppers, and dill. Yes, I’ll say it again. I’m happy to be home.